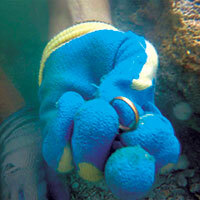 Photo: A gold ring found off Vero Beach last week by a grandson of Mel Fisher diving from the salvage boat Sea Reaper. Josh Fisher-Abt crawled along the craggy ocean floor off Vero Beach last Thursday, probing collapsed limestone ledges with a metal detector. The 36-year-old professional treasure hunter had never discovered gold at this particular site despite years of searching, but he reminded himself that others had been lucky here before. After all, a limestone-encrusted cannon stood nearby – a relic from one of 11 gold- and jewel-laden Spanish galleons that broke up and sank off Florida’s Treasure Coast in a devastating hurricane in July 1715. Then he got a hit from the metal detector. “I hand-fanned the area and I saw a little glint of gold and gold shines forever, so it had to be something special,” Fisher-Abt said later. He picked up a beautiful gold ring, shiny as the day it was made, and beneath that, a tarnished silver coin. He swam them up to the deck of the 65-foot salvage boat Sea Reaper to be catalogued and stored. Later that day, Fisher-Abt and his fellow divers recovered an ancient musket ball, a fire brick, and some large pottery shards. It’s been a slow summer for the treasure hunters of 1715 Fleet-Queens Jewels, LLC – the company that holds exclusive rights to underwater discoveries from 14 shipwreck sites stretching from Sebastian Inlet south for about 30 miles just off our barrier island coast – especially compared to 2015 when divers recovered a $4.5 million stash of gold. None of the sites has yielded multi-million-dollar coin or jewelry finds since this year’s hunting season for as many as a dozen salvage boats began in May – just a smattering of coins and artifacts, and a cannon brought up north of Fort Pierce a couple weeks ago that will be conserved and later displayed on the city’s waterfront. Salvage crews likely will wrap up operations in September when weather and sea conditions become too rough for safe diving. Meanwhile, the hunters are making the most of the time they have left. The Sea Reaper, operated by Captain Dan Porter – owner of Maritime Research and Recovery – spent several days last week anchored about 600 feet off the beach north of John’s Island Club at a site known as “Corrigan’s Wreck,” working as a sub-contractor for 1715 Fleet-Queens Jewels. Corrigan’s Wreck is named for Hugh Corrigan, a wealthy Vero Beach landowner who found gold coins on the beach in the 1950s and told treasure hunting pioneer Mel Fisher. Fisher discovered the nearby sunken wreck in 1969 and began retrieving gold from it. He won salvage rights to Corrigan’s and the other 1715 shipwrecks in the 1980s following a lengthy court battle that went all the way to the U.S. Supreme Court. Fisher died in 1998, and in 2010, his family sold its rights to 1715 Fleet-Queens Jewels. Fisher-Abt, who discovered this summer’s only gold at Corrigan’s, is Fisher’s grandson. A typical day of treasure hunting aboard the Sea Reaper consists of rising before daylight, studying underwater maps of the site on a desktop computer, adjusting the three, long sturdy anchor lines to pivot the boat over the target site, and operating two large, elbow-shaped tubes nicknamed ‘mailboxes’ on the stern that direct the boat’s propeller wash downward. “It’s kind of like using your garden hose to spray away dirt on your driveway,” Brandon explained. Once the bottom has been scoured by the mailboxes, divers wait a few minutes for the murky water to clear somewhat, then plunge down wearing scuba tanks to search the exposed sea floor with metal detectors. Maximum visibility is about 10 feet. Unless you know what to look for, it’s easy to mistake heavily-encrusted silver and other ancient artifacts for junk. Experienced treasure hunters can tell the difference, but they are unanimous that there’s no mistaking gold for anything else. After combing the site for 15 or 20 minutes, divers deliver their finds to the boat and the boat is re-positioned to enable exploration of adjacent bottom. Anything recovered is photographed, tagged, measured and catalogued on a computer and in hard copy, with a log kept for the Florida Department of State’s Division of Historical Resources. By federal court order, that agency can claim up to 20 percent of anything of archeological significance the treasure hunters find and take it for display in a museum in Tallahassee. The rest of the goods are divided among 1715 Fleet and its sub-contractors, with all distributions overseen by a federal judge. Three years ago, one of the 1715 Fleet’s dive teams hit the jackpot – 350 gold coins valued at $4.5 million. In an eerie coincidence, the discovery was made 300 years to the day after the Spanish fleet went down. That’s the sort of serendipity that keeps hope alive, according to Brandon. And sometimes brings a gleaming gold ring into view that’s been lost for hundreds of years beneath the salt water and sand of the stormy Atlantic.